Have you ever been asked to manage money or property for a loved one who is unable to pay bills or make financial decisions? Millions of Americans are facing this responsibility, which can be very overwhelming. But it’s also a great opportunity to help someone you care about, and protect them from scams and fraud. Virginia residents: There’s a guide for you! To help financial caregivers all over the country, we released the Managing Someone Else’s Money guides in 2013. But now we’re providing additional help: state-specific guides and resources for people managing money for older relatives and friends. 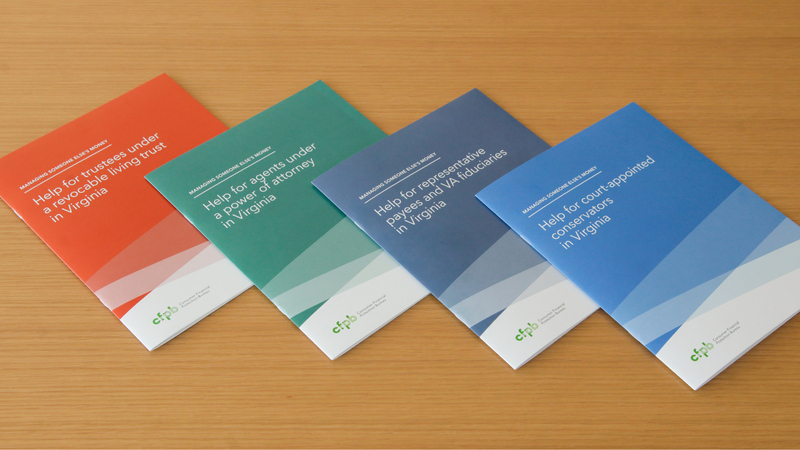 Today we are releasing a set of several Managing Someone Else’s Money guides specific to the state of Virginia. These state guides will make it easier for caregivers to follow Virginia’s unique rules and to find help close to home. The Virginia guides are easy-to-understand booklets for different kinds of caregivers. They walk you through your duties—and give you tips on Virginia laws and procedures. They tell you how to watch out for scams and financial exploitation, and what to do if your loved one is a victim. They tell you where you can go for help from agencies and service providers in Virginia and elsewhere. You can also order free print copies (including bulk orders) online. Following the release of the Virginia guides, the Bureau has plans to follow up with similar guides for five other states: Arizona, Florida, Georgia, Illinois, and Oregon. Also, we’ll make it easy for legal and aging experts in other states to adapt the guides for their states, by providing tips and templates for doing so. We’re working hard to empower older Americans to have a secure financial future. Sometimes family members, caregivers and others in the community must pitch in. We’re here to help you, too.